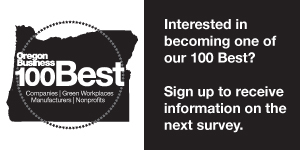 Oregon Business magazine has named the eighth annual 100 Best Nonprofits to Work for in Oregon. The rankings were revealed Thursday night during an awards dinner at the Sentinel Hotel in Portland. More than 5,000 employees from nonprofits throughout the state participated in the project. Based on the magazine’s widely regarded 100 Best Companies project, the nonprofit version was created to recognize a critical business sector that employs hundreds of thousands of workers. About 450 people turned out for the 100 Best nonprofits awards dinner and celebration. Kay Toran, CEO of Volunteers of America, delivered the keynote speech. OPB Morning Edition host Geoff Norcross served as emcee. For the full list of the 100 Best Nonprofits, click here. For more information on the 100 Best projects, go to oregonbusiness.com/oregon100best. Elisabeth, Thank you for providing your perspective. One of the values of the 100 Best Nonprofits to Work For in Oregon list is that it is based on an employee driven satisfaction survey. The editorial staff at the magazine do not decide which nonprofits are included in the list. The nonprofit employees decide. This gives the list integrity. Your idea of a list has merit. We report on nonprofits and their mission all the time. However, we believe it is important for nonprofits to practice what they preach and treat employees as they would their clients. Employee well-being is often a marker of client well-being. The survey also gives employers feedback on areas where they need to improve their workplace practices. Employers that make changes create more enjoyable workplaces for their employees. And happier employees are more motivated to carry out the mission of the nonprofits they work for. Best non-profits to work for? Really? This is not the issue. The best non-profits are those that efficiently and effectively discharge their mission whether it's feeding the poor, providing healthcare, protecting the environment. Fine if people are Cassie the Contented Cow at work. That doesn't mean anything is getting done. This is a useless and self congratulatory report. I am far more concerned with which non-profits are making a difference to their patients, clients or missions.